One of the recipes that came up in Brook's research was an oxtail dish with ham hocks that immediately appealed to me, on many levels. First, there is a lot of worthwhile history here, much of it undiscovered, and quite important to our nation's heritage. Also, I have an interest in oxtails, ever since I discovered just how tasty they are, with so much flavour, if they are cooked with a little care and a lot of love. Finally, I know from experience that if Brook recommends something, I can almost always count it as excellent advice, because of his great experience in our common interests. 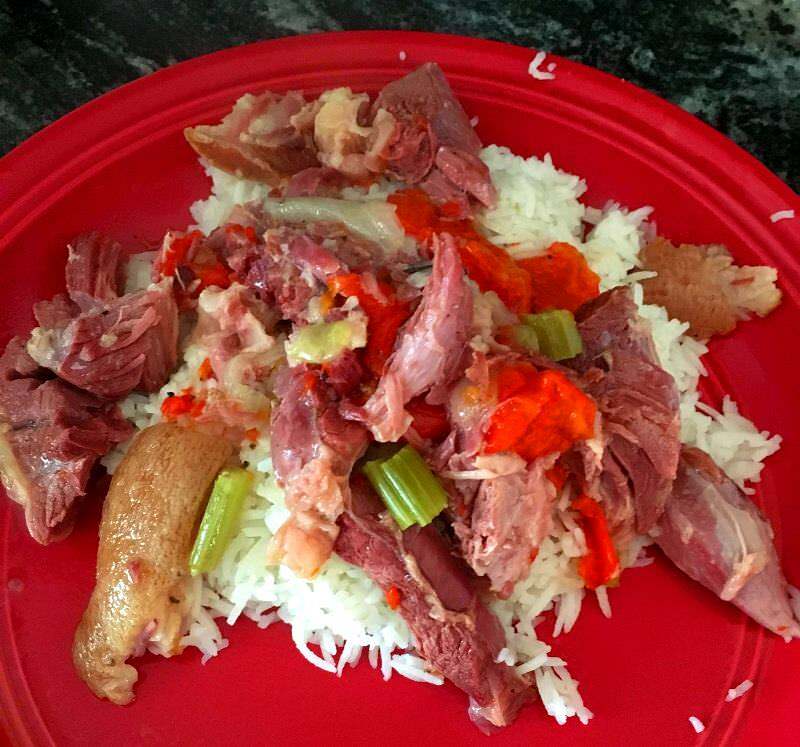 Put the ham hocks and ox tails in a medium pot two thirds filled with water and boil 15 minutes. Drain and rinse the meat under running water. Return the meat to the pot and refill with water as before. Add the bell pepper, celery, and onion. Add salt and pepper to taste. Boil until the meat is tender, 2 hours or more. You may have to add more water before the meat is done, but don’t add more than 2-3 cups, because you want the gravy to be rich. I was finally able to try these oxtails this past Saturday; first and foremost, I want to say that this recipe has a veritable TON of flavor! The ingredients list might be short, but don't let that keep you from trying this dish; even in spite of a couple of potential problems on my part, it was, simply, amazing. The first problem arose from the meat itself. I took out two oxtails for this preparation; a little more than called for in the recipe, but I figured it would be okay. Unfortunately, one of the packages was older and the packaging had apparently ripped sometime; as a consequence, it was badly freezer-burned. Because of this, I was only able to use one oxtail for the recipe, but since there weren't many of us at home that day, it worked out just fine. Additionally, the package of ham hocks that I bought contained three, rather than two, so it all worked out and everyone got plenty of both beef and pork. The preparation work for the dish went fine; we followed the recipe to a "T" - except for the fact that we used a red bell pepper, rather than a green one, due to personal preference. The celery and onion are the only other ingredients, so the work went quickly, and it was soon time to get started. First, I prefer to follow a recipe the first time, in order to get some perspective on what the author intended; the only time I deviate this would be if there are any glaring errors in the recipe, or any ingredients that I cannot find or won't use (in this case, green pepper). Once I've prepared a recipe as (or as closely as possible to) the original intent, I am not shy about modifications or changes, but then I will have a baseline. Second, I stopped and considered that the essence of Gullah cooking is much flavor and nourishment, with little in the way of refinements or elevation. Would someone in the Gullah culture take the time to sear the oxtails first? Maybe, but it seemed just as likely - or more - that this would not be done, based on my (admittedly little) knowledge of the foodways. With this in mind, I elected to proceed as the recipe was written and brought the water to a boil. Once the boil was reached, I reduced the heat and simmered the meats at a slow boil, barely more than a simmer, for 15 minutes. This served to remove a lot of the excess fat while also carrying away many of the proteins(?) and other "gunk" in the form of foamy scum, ensuring a pure, clean-tasting base for the final product. After 15 minutes, I drained and rinsed the meats, then began again, as instructed by the recipe. Once the Dutch oven was at the second boil, I committed my primary execution error. I should probably have kept the Dutch oven on the stovetop, uncovered, at a slow simmer. Brook and I discussed the wording of the recipe, and we both agreed that a full-on, hard boil was not intended. However, out of habit arising form preparing so many other similar dishes, I put the pot in the oven at about 275, with the cover only partially on/off. I wanted the oxtails to cook slowly and evaporate off much - but not all - of the water, about half; and I figured this would be a good way to achieve those twin goals. This might have worked, had I kept the pot completely uncovered, but instead, after three hours, I had more of a soup than a dish swimming in rich gravy. Since I'd never made this before, I wasn't sure how thick it should be, but I suspect that it should have been thicker than this. No worries, though - it was a cold, wintery day, and a perfect one for soup! I adjusted the salt and pepper, then served this in bowls, rather than on plates. Those are only three words to describe the result. I really enjoyed this, and so did the family. Even The Beautiful Mrs. Tas, who has never been enthusiastic about my previous oxtail projects, said this had really nice, wonderful flavor. I would never have believed it, except I was there! The best part - for me - is that I can get locally-raised-and-butchered oxtails for free...or, at the most, for 3 dollars each; so, I can make this again, and soon! For the next preparation, I plan to do everything exactly the same, except I will use a little less water and cook them either longer in the oven or on the stovetop - uncovered - until I get the consistency that I am looking for in the liquids. My goal will be to have something that is thicker than a soup, closer to a stew or gravy. If the oxtails aren't quite tender by then, I'll simply cover the pot and let them ride until they are just right. But, I must stress again, the thinner consistency did not take away from the absolutely wonderful flavor in the slightest; those oxtails really pay off in that department. If I end up with soup again, I will not be disappointed at all. If you have even a passing interest in oxtail recipes, or in trying oxtails for the first time, I strongly recommend this recipe. Even if you make a mistake or two, it will turn out great, as long as you remember low, slow cooking in order for the oxtails to become tender, melt-in-your-mouth pods of deliciousness. Cool Beans Ron! I do love slow braises like this. I had a similar dish once when duck hunting in La. That one was done with hocks, and duck breasts, and of course the trinity and a little cayenne and some garlic. They served it with rice, and it was one of the best duck dishes i have ever had. Of course it makes sense, as the Creole/Cajun/High/and Low foods in that part of the country would have a very similar genesis to those Brook wrote about with the Gullah culture. I gotta give the ox-tails and hacks blend a go. Ox-tails are still fairly popular around my area, and a couple of the local stores carry them all the time - but i think most people around here use them for soup - Kind of an interesting side note that validates Brook's opinion that ALL food is "fusion" cooking; the soup that most folks in my area make up as "ox-tail soup" Could really easily pass for the Scotch Broth from another post! Root veggies, barley and all. I reckon I grew up eating that soup, John. And that was in New York. Of course, back then ox-tails (along with oh, so many, other cuts) were among the cheap cuts. There just aren't any of those, anymore. Just consider that flank steak sells for as much as 15 bucks/pound. When I was a kid, short ribs were another cheap cut. In fact, as with squab, it was all but unique to New York. Now short ribs are "gourmet" food, and it takes a second mortgage to buy them. The ultimate in this was veal. Younger cooks can't believe this, but veal was less expensive than beef, and was a mainstay protein among the poor and lower classes. Getting this back on track, I love ox-tails (also short ribs). But for a long time I wouldn't eat them, because I associated them with poverty. I hear ya! In fact we were still buying short ribs locally for 99 cents/pound about 5 years ago, now they are 7-8 normally. (But then chicken wings which i used to get FOR FREE for soup stock from a local grocer, are 4-5 bucks on a good day!) We can add: Monk fish, shrimp, lamb shoulders, salt cod, rabbit, and real round steaks with the big old marrow filled leg bone still in it, to cheaper cuts of my youth now LONG gone to the expensive aisle. And sadly many dishes i learned and new as a youth have sat gathering dust. Gunhaus, You mentioned an oxtail/barley soup. Do you possibly have a recipe? Many years ago when I lived in Nebraska I had a bowl of oxtail soup at the Starlight Lounge in Seward. Without doubt it was the best soup I have ever had. I've been trying for thirty years off and on to duplicate that flavor and I'm willing to try one more recipe if you have one to recommend. Thanks! A fellow on another forum recently tried this, and was pretty impressed with the results! I'll be making this again. It cooked down really nice and the “gravy” soaked right into the rice with no waste. Not a scrap of anything left on the bones. It might have done to brown the oxtails a bit before firing them into the boil. I found the ham hocks overpowered the oxtails a bit. It was hard to tell which was which in the final product (I separated all from the bones and shredded the meat with a fork). I will definitely use a smaller hock next time. Also, I’ll score the skin of the hock first, so it separates into pieces as it cooks down.